Advocates for reusable bags say they’re cheaper in the long run. But those who favor plastic bags say the reusable bags are significantly more expensive. Like many controversial topics, the “real” cost may depend on how you look at the issue. And business owners and representatives have come down on both sides. The issue has cropped up recently as Tempe officials consider a ban on single-use plastic bags. In response, the Legislature may try to prevent cities, towns and counties from enacting ordinances banning, requiring deposits or charges for or restricting plastic bags in other ways. Reusable bags not only reduce plastic, they offer convenience for customers, help market the store’s brand, improve the company’s image and can generate income from their sales, advocates say. Joffe also said the companies would profit, too. “There would be a financial impact for retailers because they would now be selling a bag instead of giving them away for free,” Joffe said. Another business manager said customers support companies that make environmentally conscious decisions. Companies also can encourage customers to purchase reusable bags by offering savings for their use. “We do a discount for people that bring in Flower Child cloth bags,” Richter said. Those who advocate to keep plastic bags said they represent less than 1 percent of the total litter stream, customers continue to want them and they are substantially cheaper for retailers. “Paper bags are much more costly and reusable bags are also a lot more costly to the consumer,” said Tim McCabe, president of the Arizona Food Marketing Alliance. A 2010 analysis by The Beacon Hill Institute on Washington, D.C.’s 5-cent tax on paper and plastic bags called plastic bag litter an “insignificant contribution” to the overall litter stream. McCabe agreed, calling food waste a much bigger issue. He said manufacturers also use them in their products – like Trex, an ecofriendly decking company. Plastic bags cost about a penny, McCabe said. 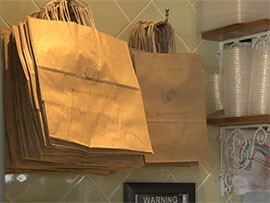 Paper bags are five times more expensive and reusable bags cost considerably more than paper, he said. Some Arizonans are recycling thousands of plastic bags into sleep mats. As part of Sacks to Mats, volunteers in Avondale crochet plastic bags into mats to give to the homeless. 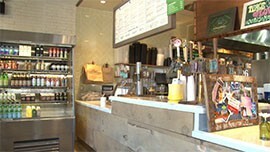 Flower Child, a restaurant in Phoenix, uses recycled materials in its paper bags and to-go containers.